Baneda Bob, the beautiful Mr Stockman Basil teddy bear given to Prince George during his visit to Queensland in 2014 and Shady Downs Charlotte the Mrs Stockman Basil made especially for Princess Charlotte weren’t the first Tambo Teddies to be given to Royalty. Prince Christian, the future king of Denmark, was the lucky recipient of a Mr Stockman teddy bear when he was born on October 15, 2005. ‘Tambo Station Donaldson’ was given to the new baby prince by Lawrence Springborg and the 2005 State Opposition party. 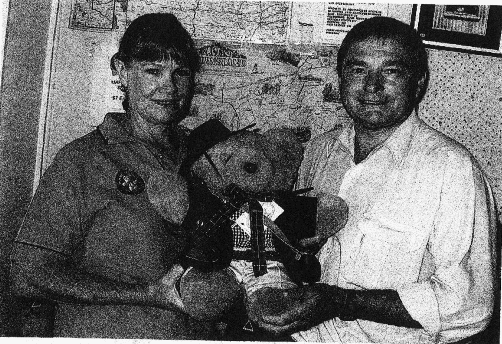 The National party decided to send one of the hand-made teddy bears on behalf of all Queenslanders after then Premier Beattie ruled out a gift from the State. The little baby prince’s mother, Princess Mary, was born in Tasmania and it was decided that it was very appropriate for the new baby to be given a gift that was handmade with love in the Outback. ‘Tambo Station Donaldson’ was named for Princess Mary who was formerly a ‘Donaldson’ and he was the 27,500 bear ever made. The teddy bear was collected by Howard Hobbs, MLA, former member for Warrego, on October 21st and flown to Brisbane where parliamentary members, Vaughan Johnson, Howard Hobbs and Lawrence Springborg presented this beautiful bear to the Danish Consulate to send on over to the Palace. Reflecting on this story, we realise that Tambo Teddies are just perfect gifts for little Princes and Princesses and every baby born is someone’s little Prince or Princess and needs a Tambo Teddy just like Prince George and Prince Christian.